For other people named Cam Newton, see Cam Newton (disambiguation). Cameron Jerrell Newton (born May 11, 1989) is an American football quarterback for the Carolina Panthers of the National Football League (NFL). He played college football at Auburn and was drafted as the first overall pick by the Panthers in the 2011 NFL Draft. Newton is the only player in the modern era to be awarded the Heisman Trophy, win a national championship, and become the first overall pick in an NFL draft within a one-year span. He was the 2011 NFL Rookie of the Year, is a three-time Pro Bowler, and was named the NFL MVP in 2015. In his rookie year, Newton broke all-time NFL rookie records for passing and rushing yards. He became the first NFL quarterback to throw for 400 yards in his first game, shattering Peyton Manning's first-game record by 120 yards. He also broke Otto Graham's 61-year-old record for passing yards by any quarterback in an NFL debut. Newton went on to become the first rookie quarterback to throw for 4,000 yards in a season. He also ran for 14 touchdowns, more in a single season than any quarterback in NFL history, breaking Steve Grogan's 35-year-old record. In 2015, Newton became the first quarterback in NFL history to throw for at least 30 touchdowns and rush for 10 in the same season (35 passing, 10 rushing). He also became the only quarterback ever to have 300 yards passing, 5 touchdown passes, and over 100 yards rushing in the same game. Newton capped off the 2015 season by capturing MVP honors and leading the Panthers to a 15–1 record and a trip to Super Bowl 50. Newton attended Westlake High School in Atlanta, Georgia, where he played for the Westlake Lions high school football team. As a 16-year-old junior, he passed for 2,500 yards and 23 touchdowns and ran for 638 yards and nine touchdowns, gaining the attention of major college programs. In his senior year, Newton was rated a five-star prospect by Rivals.com, the No. 2 dual-threat quarterback in the nation, and the 14th quarterback and 28th player overall. He received scholarship offers from Florida, Georgia, Maryland, Ole Miss, Mississippi State, Oklahoma, and Virginia Tech. He committed to the University of Florida at the beginning of his senior year, becoming part of the top-rated recruiting class in the country for 2007. "Florida Football Commitments". Rivals.com. Retrieved November 6, 2013. "2007 Florida Football Commits". Scout.com. Retrieved November 6, 2013. "ESPN". ESPN.com. Retrieved November 6, 2013. "Scout.com Team Recruiting Rankings". Scout.com. Retrieved November 6, 2013. "2007 Team Ranking". Rivals.com. Retrieved November 6, 2013. 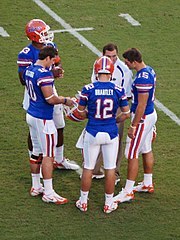 Newton initially attended the University of Florida, where he was a member of the Florida Gators football team in 2007 and 2008. As a freshman in 2007, Newton beat out fellow freshman quarterback John Brantley as the back-up for eventual Heisman Trophy winner Tim Tebow. He played in five games, passing for 40 yards on 5-of-10 and rushing 16 times for 103 yards and three touchdowns. In 2008, during his sophomore season, Newton played in the season opener against Hawaii but suffered an ankle injury and took a medical redshirt season. On November 21, 2008, Newton was arrested on felony charges of burglary, larceny, and obstruction of justice on an accusation that he stole a laptop computer from another University of Florida student. He was subsequently suspended from the team. Campus police "tracked the stolen laptop to the athlete...Newton tossed the computer out his dorm window in a humorously ill-advised attempt to hide it from cops." All charges against Newton were dropped after he completed a court-approved pre-trial diversion program. "I believe that a person should not be thought of as a bad person because of some senseless mistake that they made," said Newton in 2010. "I think every person should have a second chance. If they blow that second chance, so be it for them." Newton announced his intention to transfer from Florida three days before the Gators' national championship win over Oklahoma. In November 2010, Thayer Evans of Fox Sports reported that Newton faced potential expulsion from the University of Florida for three instances of academic dishonesty, prior to transferring. In January 2009, Newton transferred to Blinn College in Brenham, Texas, to play for head coach Brad Franchione, son of Dennis Franchione. That fall, he led his team to the 2009 NJCAA National Football Championship, throwing for 2,833 yards with 22 touchdowns and rushing for 655 yards. He was named a Juco All-America honorable mention and was the most recruited Juco quarterback in the country. Newton was ranked as the number one quarterback from either high school or junior college by Rivals.com and was the only five-star recruit. During Newton's recruitment, Oklahoma, Mississippi State and Auburn were his three finalists. He eventually signed with the Auburn Tigers. Newton started the first game of Auburn University's 2010 season, a home win over Arkansas State on September 4, 2010. Newton accounted for five total offensive touchdowns and over 350 yards of total offense. He was named SEC Offensive Player of the Week following his performance. Three weeks later, Newton had a second break-out game with five total touchdowns and over 330 total offensive yards against the South Carolina Gamecocks. On October 2, 2010, Newton led Auburn to a 52–3 victory over Louisiana-Monroe. He completed three touchdown passes, one of which went for 94 yards. It was the longest touchdown pass and offensive play in Auburn football history. On October 9, 2010, Newton led Auburn to a 37–34 victory over Kentucky. He passed for 210 yards and rushed for 198 yards including 4 rushing touchdowns. On October 16, 2010, during the Arkansas game, Newton ran for three touchdowns and threw one touchdown pass. Following these performances, media reports began to list Newton among the top 5 candidates to watch for the Heisman Trophy. On October 23, 2010, Newton led Auburn to a 24–17 victory over the LSU Tigers. He rushed for 217 yards in the game, giving him 1,077 yards for the season, and set the SEC record for yards rushing in a season by a quarterback—a record previously held by Auburn quarterback, Jimmy Sidle, that had stood for over 40 years. After this game, Newton became just the second quarterback to rush for over 1,000 yards in the conference's history. He also broke Pat Sullivan's school record for most touchdowns in a single season—a record that had stood since 1971—with 27. Both of these records were broken on the same play: a 49-yard touchdown run in which Newton escaped two tackles, corrected himself with his arm, eluded two additional tackles, and dragged a defender into the endzone for the touchdown. The play was described as Newton's "Heisman moment". Auburn received its first No. 1 overall BCS ranking, and Newton was listed as the overall favorite for the Heisman. By halftime of the game against Georgia, Newton became the first SEC player to ever throw for 2,000 yards and rush for 1,000 yards in a single season. With the 49–31 victory, Auburn extended its winning streak to 11–0 and clinched the SEC West, allowing them to play in the SEC Championship game. Newton led Auburn to a 28–27 victory over Alabama in the Iron Bowl after being down 24–0. The 24-point come-from-behind victory was the largest in the program's 117-year history. He passed for 216 yards with three passing touchdowns and ran for another. On December 4, 2010, Newton led the Tigers to an SEC Championship, their first since 2004, by defeating South Carolina 56–17, setting an SEC Championship Game record for most points scored and largest margin of victory. Newton was named the game MVP after scoring a career-best six touchdowns (four passing and two rushing). With his performance, Newton also became the third player in NCAA FBS history to throw and run for 20-plus touchdowns in a single season (along with former Florida teammate Tim Tebow and Colin Kaepernick, who reached the milestone earlier the same day). Newton was named the 2010 SEC Offensive Player of the Year as well as the 2010 AP Player of the Year. He was also one of four finalists for the 2010 Heisman Trophy, which he won in a landslide victory. He is the third Auburn player to win the Heisman Trophy (along with Pat Sullivan and Bo Jackson). Following the victory in the SEC Championship, Auburn was invited to participate in the school's first BCS National Championship Game. The game took place on January 10, 2011, in Glendale, Arizona, with Auburn playing against the Oregon Ducks. In a game that Steve Spurrier predicted to score as high as 60–55, Auburn beat Oregon just 22–19 to win the BCS National Championship. Newton threw for 262 yards, two touchdowns, and one interception. He also rushed 22 times for 65 yards, though he lost a fumble that later allowed Oregon to tie the game with limited time remaining. Once Auburn received the ball, Newton drove the Tigers down the field to win the game on Wes Byrum's last-second field goal. Media outlets wrote Newton was upstaged by teammate Michael Dyer (the game's Offensive MVP) and Auburn's defense, which held the high-powered Oregon ground game to just 75 yards On January 13, three days after winning the BCS National Championship, Newton declared for the 2011 NFL Draft, forgoing his senior season. Newton spent much of the second half of the 2010 football season embroiled in a controversy regarding allegations that his father, Cecil Newton, had sought substantial sums of money in return for his son playing for a major college football team, in violation of National Collegiate Athletic Association rules. In early November 2010, several Mississippi State University athletic boosters reported to the media that, during their recruitment of his son out of Blinn College nearly a year earlier, Cecil Newton said that it would take "more than just a scholarship" to secure his son's services. This demand was communicated by booster and former Mississippi State football player Kenny Rogers to fellow boosters and former teammates Bill Bell and John Bond. Rogers said in a Dallas radio interview that Cecil Newton said it would take "anywhere between $100,000 and $180,000" to get his son to transfer to Mississippi State. Auburn maintained throughout the investigation, which had begun several months before the public was made aware of it, that they were not involved in any pay-for-play scheme and that Cam Newton was fully eligible to play. On November 30, Auburn declared Cam Newton ineligible after the NCAA found evidence that Cecil Newton solicited Mississippi State $120,000 to $180,000 in exchange for Cam Newton's athletic service, a violation of amateurism. Auburn immediately filed to have him reinstated on the basis that Kenny Rogers could not be considered an agent and that Cam Newton was not aware of his father's illegal activity. The NCAA almost immediately sided with Auburn and reinstated Newton the next day on December 1, declaring him eligible for the 2010 SEC Championship Game three days later, stating that there was not sufficient evidence that Cam Newton or anyone from Auburn had any knowledge of Cecil Newton's actions. Auburn subsequently limited the access Cecil Newton had to the program as result of NCAA findings. Also, due to increased pressure by the media and the NCAA investigation, Cecil Newton announced he would not attend the Heisman Trophy Ceremony. The NCAA reinstatement did not clear Cecil Newton of any wrongdoing; it did, however, establish Cam Newton's eligibility as a candidate for the Heisman Trophy, which he won in a landslide victory with 2,263 points and 729 first-place votes. In October 2011, the NCAA officially closed its 13-month investigation into the recruitment of Cam Newton, unable to substantiate any allegation or speculation of illicit recruiting by Auburn, and concluded that Cecil Newton only solicited a cash payment from Mississippi State and no other institution attempting to recruit his son. The investigation, which consisted of over 50 interviews and the reviewing of numerous bank records, IRS documents, telephone records, and e-mail messages, resulted in no findings that would indicate Auburn participated in any pay-for-play scenario in signing Cam Newton. The NCAA said that the allegations failed to "meet a burden of proof, which is a higher standard than rampant public speculation online and in the media" and that the allegations were not "based on credible and persuasive information". The NCAA's Stacey Osburn said "We've done all we can do. We've done all the interviews. We've looked into everything and there's nothing there. Unless something new comes to light that's credible and we need to look at, it's concluded." In late January 2011, Newton began working out with George Whitfield Jr. in San Diego. Whitfield has worked with other quarterbacks such as Ben Roethlisberger and Akili Smith. On April 28, 2011, Newton was selected with the first overall pick in the 2011 NFL Draft by the Carolina Panthers. He was the first reigning Heisman Trophy winner to go first overall since Carson Palmer in 2003. He also was Auburn's fourth No. 1 selection after Tucker Frederickson (1965), Bo Jackson (1986), and Aundray Bruce (1988). During the 2011 NFL lockout, he spent up to 12 hours a day at the IMG Madden Football Academy in Bradenton, Florida, spending up to two hours per day doing one-on-one training with fellow Heisman Trophy winner and ex-Panthers quarterback Chris Weinke. Before the draft, Panthers owner Jerry Richardson asked Newton to maintain his clean-cut appearance after Newton told Richardson he had no tattoos or piercings and was thinking about growing his hair longer. Although this is similar to a policy the New York Yankees has on all of its players, this gained some controversy on Richardson's part due to the fact that other players on the team didn't meet these guidelines. Dave Zirin, reporter for TheNation.com, even accused Richardson of racism. Despite this, Newton agreed to Richardson's requests and was drafted first overall. All values from 2011 NFL Scouting Combine. On July 29, 2011, Newton signed a four-year contract, worth over $22 million, with the Carolina Panthers that was fully guaranteed. After unsuccessfully negotiating with quarterback Jimmy Clausen for the No. 2 jersey Newton wore at Auburn, he decided to keep the No. 1 jersey that the Panthers had assigned him after the draft. His quarterbacks coach was Mike Shula, former head football coach of his college rival Alabama. A month later on September 1, 2011, he was named the Panthers' starting quarterback, ahead of Derek Anderson and Clausen. In his NFL debut game on September 11, 2011, Newton was 24–37 passing for 422 yards, two touchdowns, and one interception, in a 28–21 road loss to the Arizona Cardinals. With a quarterback rating of 110.4, he also rushed for a touchdown, and became the first rookie to throw for 400+ yards in his first career game. His 422 passing yards broke Peyton Manning's rookie record for most passing yards on opening day. In his second career game, a 30–23 home loss to the defending Super Bowl champion Green Bay Packers, Newton broke his own record, set the weekend previously, with 432 yards passing, throwing and rushing for a touchdown. Newton's 854 passing yards through the first two games of the season, the most in league history by a rookie, broke the NFL record of 827 set by Kurt Warner in the 2000 season and stood as the most by any quarterback in the first two weeks of the season until New England's Tom Brady broke the mark again later in the day with 940. He also became the only player to begin his career with consecutive 400-yard passing games and broke the Carolina Panthers franchise record of 547 yards previously held by Steve Beuerlein. After Newton's second career game, Packers quarterback Aaron Rodgers commented, "I think someone said in the locker room that I'm kind of glad we played him early in the season because when he figures it out fully, he's going to be even tougher to stop." Newton's three additional interceptions against the Packers tied him for the most interceptions thrown in the league. His total passing yards over the first three games was 1,012 yards. The Panthers recorded their first victory of the season against the Jacksonville Jaguars 16–10. Newton threw for 158 yards and one touchdown. The Panthers played the Atlanta Falcons, losing 31–17 while passing for 237 yards with no passing touchdowns. Newton increased his team's record to 2–5 with a Week 7 win over the Washington Redskins 33–20. He threw for 256 yards and one touchdown, completing 18 of his 23 passes. He also rushed for 59 yards and a touchdown, including one run for 25 yards. This performance brought Cam a passer rating of 127.5, his highest yet. With Carolina's win over the Indianapolis Colts, Newton became the fourth rookie quarterback to pass for over 3,000 yards in his first season, joining Peyton Manning, Matt Ryan, and Sam Bradford. Newton set the NFL rushing touchdown record for quarterbacks on December 4, 2011, rushing for his 13th touchdown of the season in the fourth quarter against the Tampa Bay Buccaneers. The historic performance was part of a career-high three rushing touchdowns, which were part of a 38–19 win. In that game, he also caught a 27-yard pass from wide receiver Legedu Naanee, making him a triple threat. On December 24, 2011, in a 48–16 victory over the Tampa Bay Buccaneers, Newton threw for 171 yards and three touchdowns and also rushed for 65 yards and a touchdown. In the process, he broke Peyton Manning's record of 3,739 yards passing for a rookie. On January 1, 2012 against the New Orleans Saints, Newton threw for 158 yards and became the first rookie quarterback to throw for 4,000 yards. He finished his rookie season with 4,051 yards. Over the course of the season, when Newton had a turnover, the team was 0–10; when he had no turnovers, the team went 6–0. On January 22, 2012, Newton was named to be heading to the Pro Bowl after the New York Giants beat the San Francisco 49ers in the NFC Championship. Because Eli Manning was one of the three quarterbacks for the NFC to be selected, and with Newton being picked as the NFC alternate later in December, Newton was able to play in the Pro Bowl with Manning headed to the Super Bowl. He finished the Pro Bowl with 186 yards along with two touchdowns and three interceptions. Newton was named both AP Offensive Rookie of the Year and Pepsi NFL Rookie of the Year on February 4, 2012. He became the second straight number one pick to win the AP Rookie of the Year, after Sam Bradford won it the previous season. He was also the first Panther to win the Offensive award, but the second Panthers rookie of the year, following Julius Peppers, the AP Defensive Rookie of the Year in 2002. Cam received his Offensive Rookie of the Year, and Pepsi NFL Rookie of the Year awards on the inaugural NFL Honors award show, with 47 of the 50 possible 50 AP votes (the other 3 going to Andy Dalton). He also landed the number 5 and 2 play of the year with his 49-yard touchdown run against the Tampa Bay Buccaneers (5), and his touchdown fumblerooski to Richie Brockel vs. the Houston Texans. He has the nickname Superman due to his touchdown celebration. Newton was rated as the 40th best player in the NFL by his peers on the NFL Top 100 player list. His rookie season was when he started the Carolina Panther tradition "Sunday Giveaway", where the Panthers offensive players typically give away the football that they just scored a touchdown with to kids in the stands. The Panthers finished the season at 7–9. Though this season could be seen by some as a "Sophomore Slump," he did improve in many statistical categories, improved on his efficiency, and cut back on his turnovers. Cam's noticeable decline in rushing touchdowns was due partially to the Panthers signing Mike Tolbert before the season began. Tolbert, a versatile fullback, was able to score goal line touchdowns as Cam had his rookie season. In Week 14, a 30–20 victory over the Atlanta Falcons, he had a career-high 116 rushing yards and a rushing touchdown to go along with 287 passing yards and two passing touchdowns. He finished his second professional season with 3,869 passing yards, 19 passing touchdowns, 12 interceptions, 741 rushing yards, and eight rushing touchdowns. Newton also led the league in Yards Per Completion (13.8)  and was tied for second with Peyton Manning in Yards Per Attempt (8.0) behind Robert Griffin III. Newton was rated as the 46th best player by his peers on the NFL Top 100 Players of 2013 list. Newton in 2014 Pro Bowl. The 2013 season turned out to be a success, with Newton leading his team to a 12–4 record and a first round bye in the playoffs. In the regular season, he recorded 3,379 passing yards, 24 touchdowns, 13 interceptions, 585 rushing yards, and six rushing touchdowns. Newton was selected for the 2014 Pro Bowl. The week after, he lost his first NFL playoff game to the San Francisco 49ers in the Divisional Round. In the 23–10 loss, he had 267 passing yards, one touchdown, and two interceptions to go along with 54 rushing yards. Newton was drafted third in the first annual Pro Bowl Draft, by Team Sanders. Newton played the second and third quarter, and rushed for a touchdown. Newton was rated as the 24th best player on the NFL Top 100 Players of 2014 list. On March 21, 2014, Newton underwent surgery to "tighten" up his ankle ligaments, which Newton admitted he had dealt with since his college days at Auburn University. The estimated recovery time was four months, which caused him to miss training camp and the first preseason game. During the third preseason game against the New England Patriots, Newton suffered a hairline fracture on his ribs after a hit from Jamie Collins. Newton's streak of starting 48 consecutive games was snapped during the Panthers opening game 20–14 victory over the Tampa Bay Buccaneers. Newton made his debut during Carolina Panthers home opener against the Detroit Lions in Week 2. He recorded 300 yards of offense with a touchdown, no turnovers, and a 100.2 quarterback rating en route to a 24–7 victory. Through his first three starts in the season, Newton recorded a 110.8 quarterback rating against the blitz. During the Panthers Week 5 victory against the Chicago Bears, Newton led the Panthers from a 14-point deficit and was named to the Pro Football Focus (PFF) Team of the Week for his performance. Senior producer of NFL Films Greg Cosell and respected Football Outsiders columnist and Pre Snap Reads owner, Cian Fahey, both noted Newton's clear development and growth as a pocket passer. During the Panthers Week 6 37–37 tie against the Cincinnati Bengals, Newton accounted for 91% of the offense, recording a career-high 29 of 46 completions for 286 yards with two touchdowns and an interception along with 17 rushing attempts for 107 yards and a rushing touchdown, the most since the 2012 Week 14 win against Atlanta, when he had 116 on nine carries. Through the first six games in the season, Newton averaged 2.53 seconds to attempt a pass (2.73 in 2013) and has had the ball out in under 2.5 seconds on 51.8% of his drop-backs (40% in 2013). Newton had arguably his best game of the season in a 41–10 victory over the New Orleans Saints. Newton completed 21–33 passes for 226 yards and three touchdowns. Along with that he had 83 rushing yards and one rushing touchdown. He was named NFC Offensive Player of the Week for his efforts in that game and with this performance, Newton has had four games with at least 200 passing yards and 80 rushing yards with multiple touchdown passes and a rushing touchdown. That is the most such games in NFL history. Two days following the Saints game, Newton was involved in a well-publicized car crash in which he fractured two vertebrae in his lower back. He missed only one game and returned to the field a week later in a match against the Cleveland Browns to make the final end-of-season push to win the NFC South division and once again make the playoffs. Newton led the Carolina Panthers to the first back-to-back division titles in the NFC South since the formation of the division and became the first quarterback since Michael Vick and Randall Cunningham as the only quarterbacks in NFL history with four seasons with at least 500 rushing yards. During the season, Newton also tied John Elway, Otto Graham, and Y. A. Tittle for 10th all time in rushing touchdowns by a quarterback with 33. Further, with his four victories in December, Newton ranked second in the NFL in December wins over the past four years with 14 only behind Tom Brady. Newton's 33 rushing touchdowns were the most by a quarterback in his first four seasons. He is also the only player in NFL history to have 10,000 passing yards and 2,000 rushing yards in his first four seasons and the first to have at least 3,000 passing yards and 500 rushing yards in four consecutive seasons. The following week, Newton led the Panthers to their first playoff win in nine years in the Wild Card Round over the Arizona Cardinals, throwing for 198 yards and two touchdowns while running for 35 yards. Newton and the Panthers were defeated by the Seattle Seahawks 31–17 in the Divisional Round. Newton was 23–36 for 245 yards with two touchdowns, two interceptions, and 37 rushing yards. Despite missing two games and dealing with ankle, rib, throwing hand, and back injuries through the entire season, Newton was rated as the 73rd best player in the NFL on the NFL Top 100 player list. Newton playing against the New Orleans Saints in 2015. On June 2, 2015, the Panthers and Newton agreed to a five-year, $103.8 million contract extension. Through the 2015 preseason, Newton graded as PFF's best quarterback. During the season-opener against the Jacksonville Jaguars, Newton finished with 175 yards passing, one touchdown, and one interception, while rushing for 35 yards. This was the first NFL opening-day victory for Newton (the Panthers won their opener in 2014 with an injured Newton on the sidelines). During the Panthers' Week 2 victory over the Houston Texans, Newton finished with 195 yards passing, two passing touchdowns, and one interception, while rushing for 76 yards and one touchdown. In week three against the New Orleans Saints, Newton passed for 315 yards and two passing touchdowns to go along with a rushing touchdown. It marked the 26th game in Newton's career in which he had a passing and a rushing touchdown, ranking second all-time in NFL history behind only Steve Young (31). Further, it marked the 14th time in his career where Newton notched two-plus touchdown passes and at least one rushing touchdown, third-most in the NFL since 1960, behind only Steve Young (17) and Fran Tarkenton (16). Through the first three games of the season, Newton accounted for 76% of the total offensive yards and 88% of the total touchdowns the Panthers generated. Newton helped lead the Panthers to a 3–0 start, the first time they had done so since the 2003 NFL Season. Several experts noted Newton's continued growth as a quarterback; Gil Brandt noted Newton's improving internal clock in the pocket, citing his career low sack percentage of 4.8% in the early season; senior NFL columnist for CBSSports.com, Pete Prisco, noting Cam's improved pocket patience, mechanics, and ability to read defenses; Cian Fahey noted Newton's development into a refined pocket passer with the athleticism to diversify any offense with a multidimensional run game. In the following week, during a 37–23 victory over the Tampa Bay Buccaneers, Newton went 11 of 22 passing for 124 yards and two touchdowns while leading the team in rushing with 51 yards to give the Panthers a 4–0 record for the first time since 2003. As a rusher, through the first four weeks, Newton ranked 3rd in the NFL in rushes for first downs. Following a Week 4 bye, Newton threw for 269 yards, two interceptions, and a touchdown and rushed for 30 yards and a touchdown while leading the Panthers to victory against the Seattle Seahawks. It marked just the 3rd home Seahawks loss in the Russell Wilson era. It also marked the first franchise win in Seattle and Newton's ninth career fourth-quarter comeback win. During the game, Newton also recorded the 36th career rushing touchdown of his career; over that span, only Marshawn Lynch and Adrian Peterson were the only players to record more rushing touchdowns since 2011. Through the first five weeks of the season, Newton recorded a career-high 67.6% of passes under pressure. 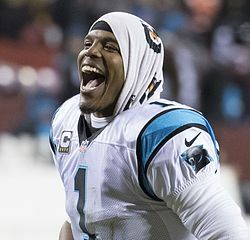 The following week against the Philadelphia Eagles, Newton led the Panthers to a victory, earning the Panthers their first 6–0 record in franchise history; during the game, he threw three interceptions and recorded his 28th game with a rushing touchdown and a passing touchdown. In Week 8, against the Indianapolis Colts, Newton threw for 248 yards, two touchdowns, and one interception, as the Panthers moved to 7–0 with a 29–26 overtime victory; with the win, Newton became the first quarterback in NFL history to earn a comeback victory with his team trailing in overtime. The following week, Newton led the Panthers to their first 8–0 start in franchise history with a 37–29 victory over the Green Bay Packers; Newton went 15–30 for 297 yards passing, three touchdowns, and one interception to go along with 9 rush, 57 yards, and one touchdown. Further, for the first time in his career, Newton threw for 200 yards and three touchdowns in a single half. For his game against the Packers, Newton was named the NFC Offensive Player of the Week. The following week, during the Panthers 27–10 victory over the Tennessee Titans, Newton went 21 for 26 passes for 217 yards and 1 passing touchdown while recording 9 rushes for 23 yards and 1 rushing touchdown. Newton began the game with 11 straight completions, tying his career best in a single game (vs. Bucs on 11/18/12). The following week, Newton led the Panthers to a 44–16 victory over the Washington Redskins. During the game, Newton threw for a career-high five touchdown passes and became the only quarterback in NFL history with 100+ passing touchdowns and 25+ rushing touchdowns in his first five seasons. For his efforts, Newton was named the NFC Offensive Player of the Week for the second time this season. During the Panthers 33–14 victory over the Dallas Cowboys on Thanksgiving, Newton completed 16-of-27 passes for 183 yards, including going 8-of-16 on third downs, and rushed 12 times for 45 yards and a touchdown. During the Panthers 41–38 victory over the New Orleans Saints, Newton finished with 380 combined passing and rushing yards and five touchdown passes. He was 10 of 14 for 154 yards, two touchdowns and a 147 QB Rating under pressure. He also led the game-winning 75-yard touchdown drive to the Panthers undefeated through their first 12 games. For his performance, Newton was named NFC Offensive Player of the week for the third time in five weeks. The last time a player achieved that feat was 2007, when Tom Brady of the New England Patriots won three player of the week awards in five weeks while quarterbacking the New England Patriots during an undefeated regular season. The following week, during the Panthers 38–0 victory over the Atlanta Falcons, Newton completed 15 of 21 passes for 265 yards, 3 passing touchdowns, and finished with a career-high quarterback rating of 153.3. The Panthers amassed 225 yards of offense in just the first quarter of the game; a franchise record. During the Panthers thrilling 38–35 victory against the New York Giants, Newton went 25 of 45 for 340 yards and 5 passing touchdowns while adding 8 rushes for 100 yards, his third career game with at least 100 rushing yards. Newton also led the Panthers on his 12th-ever game-winning drive, and his fourth of the season. For his efforts, Newton was again named the NFC Offensive Player of the Week. Newton became the NFL's first player to win the award four times in a seven-week span since San Diego's LaDainian Tomlinson in 2006. Through the first 15 weeks of the NFL season, Newton led the Panthers to a 14–0 record. During that span, he also threw the second-most touchdown passes and led the NFL with 40 combined passing and rushing touchdowns. Newton was on the field for 660 of Carolina's 923 plays in which he was either the decision-maker or ball carrier after the snap, which accounted for 72 percent of the Panthers' total snaps. Further, Newton had the second-lowest percentage of passing yards gained after the catch among NFL quarterbacks and 40 of Carolina's 49 touchdowns this season were either thrown or run by Newton. The Panthers had their first setback in the 20–13 away loss to the Atlanta Falcons in their second divisional matchup. In the loss, Newton was 17 of 30 for 142 yards. In a 38–10 win over the Tampa Bay Buccaneers during the regular season finale, Newton tied his season-best completion percentage (80.8), threw for almost 300 yards and added a pair of touchdowns and had his first game with two rushing touchdowns since Week 12 of the 2012 season. His passer rating of 139.3 was the second best mark he posted all season. For his efforts, he was named the NFC Offensive Player of the Week for the fifth time in the season. Newton became the first player to win five NFC Offensive Player of the Week awards in a nine-week span within a season and his five awards tied for the most in a season in NFL history (Tom Brady, 2007). Cam Newton led NFL quarterbacks in rushing attempts, rushing yards, and rushing touchdowns in 2015. Newton's 45 total touchdowns during the regular season marked the most touchdowns by a single player since 2013. Newton was selected as the 2015 NFL MVP and Offensive Player of the Year by the PFWA. 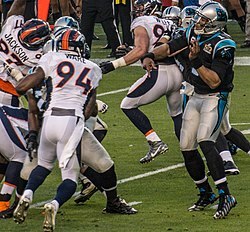 Newton in Super Bowl 50 against the Denver Broncos. Newton and the Panthers finished the season with a 15–1 record, a franchise best, and earned a first-round bye in the playoffs. They defeated the Seattle Seahawks in the Divisional Round by a score of 31–24, despite nearly blowing a 31–0 lead, and went on to defeat the Arizona Cardinals 49–15 in the NFC Championship game to face the Denver Broncos in Super Bowl 50. In the NFC championship game, Newton completed 19 of 28 passes for 335 yards, with two touchdowns and one interception. He also rushed 10 times for 47 yards and two touchdowns. The Panthers' 49 points were the highest in NFC Championship history. On February 6, 2016, Newton was named NFL MVP. In Super Bowl 50 on February 7, 2016, which pitted the Panthers' top-ranked offense against the Denver Broncos' top-ranked defense, the Panthers lost by a score of 24–10. The game was generally a one-score affair until a few minutes left in the fourth quarter. The defense of both teams performed extremely well and led to both offenses struggling terribly throughout the game. Newton was sacked six times and Manning was sacked 5 times, both quarterbacks fumbled twice, and both threw an interception. Newton was ranked as the top player in the NFL by his peers on the NFL Top 100 Players of 2016. For the season, Newton has sold the 7th most merchandise from March 2015 to February 2016. In the opening game of the 2016 season, in a Super Bowl 50 rematch against the Denver Broncos, Newton surpassed two of Steve Young's NFL records, one for the most career rushing touchdowns by a quarterback, with his 44th, and the other for most games with a passing and rushing touchdown, with his 32nd. This also tied Otto Graham's all-time professional American football mark of 44 rushing touchdowns by a quarterback. On October 2, in a loss at the Atlanta Falcons, Newton suffered a concussion on a two-point conversion run and missed the rest of the game. Newton also missed the next game against the Tampa Bay Buccaneers. On December 4, against the Seattle Seahawks, Newton was benched for the first offensive series for a dress code violation. It was Newton's first professional game, other than his first career preseason game in 2011, in which he began the game as the backup. For the 2016 season, Newton completed 52.9 percent of his passes, marking a career worst in that category. He threw 19 touchdown passes, 16 less than the previous year, and 14 interceptions, the second most of his career behind his rookie season. The Panthers regressed from their 15–1 record from the previous year to a 6–10 record in 2016. Despite a down 2016 season, Newton was still ranked 44th by his peers on the NFL Top 100 Players of 2017. On March 30, Newton had surgery to repair a partially torn rotator cuff on his throwing shoulder. During a press conference on October 4, Newton was asked a question by Jourdan Rodrigue, a female sportswriter for The Charlotte Observer, regarding passing routes. Newton smirked and said, "It's funny to hear a female talk about routes." Then he answered her question. His remarks were viewed as sexist by Rodrigue as well as many in the media. It later surfaced that Rodrigue had previously mocked Newton using a Twitter account with which she had also posted racist comments, causing the publication BlackSportsOnline.com to label her a hypocrite. The following day, yogurt company Dannon dropped Newton as a sponsor. Newton uploaded a video to Twitter later that day in which he apologized for his remarks. During Monday Night Football against the Miami Dolphins in Week 10, Newton threw for 254 yards and rushed for 95 yards with four total touchdowns. The Panthers combined for 294 rushing yards and 548 total yards of offense as the Panthers won 45–21. His performance in Week 10 earned him NFC Offensive Player of the Week. He finished the regular season with 3,302 passing yards, 22 touchdowns, 16 interceptions and a career-high 754 rushing yards. The Panthers made the playoffs as the #5-seed. In the Wild Card Round against the New Orleans Saints, he was 24 of 40 for 349 yards and two touchdowns as the Panthers lost by a score of 31–26. Newton was ranked 25th by his peers on the NFL Top 100 Players of 2018. After a 16–8 victory over the Dallas Cowboys in Week 1, Newton went 32 of 45 passing, 335 passing yards, three touchdowns, and an interception to go along with 42 rushing yards in the 31–24 loss to the Atlanta Falcons. The next week, he passed for two touchdowns and ran for two touchdowns in the 31–21 victory over the Cincinnati Bengals. In Week 7 against the Philadelphia Eagles, after being down 17–0 in the fourth quarter, Newton completed 16 of 22 passes for 201 yards and two touchdowns in the final quarter as the Panthers defeated the Eagles 21–17, earning him NFC Offensive Player of the Week. Newton and the Panthers began struggling in the month of November. After the Panthers lost to the New Orleans Saints in Week 15, which was their sixth straight loss after starting 6–2, Newton acknowledged a nagging shoulder injury that had been hampering his play during the losing streak, and hinted that the team would deactivate him for the final two games of the season in order to heal. On January 24, 2019, Newton officially underwent right shoulder surgery. In a poll orchestrated by writers from The Athletic, Newton was voted the most underrated quarterback in the league by 85 defensive players from 25 teams. First quarterback in NFL history to win both NFL Offensive Rookie of the Year and NFL MVP at some point in his career. First quarterback in NFL history to rush for 100+ yards and pass for 300+ yards with 5 touchdowns in a single game (December 20, 2015). Newton is the son of Jackie and Cecil Newton Sr., who was cut as a safety from the pre-season rosters of the 1983 Dallas Cowboys and 1984 Buffalo Bills, and the younger brother of Cecil Newton, Jr., a center who most recently played for the Baltimore Ravens. His youngest brother, Caylin, is starting quarterback for the Howard Bison. Newton was also a talented baseball and basketball player as a youth but developed a fear of being hit by a pitch in baseball and could not avoid foul trouble on the basketball court. He stopped playing baseball at 14 years old and quit basketball shortly into his high school career. Newton is a Christian. Newton spoke about his faith after winning the 2011 BCS National Championship Game saying, "It’s just a God thing. I thank God every single day. I’m just His instrument and He’s using me on a consistent basis daily." In addition to his commitment to football, Newton participates in motivational speaking. On December 9, 2014, Newton was involved in a car crash in Charlotte; his vehicle flipped. Newton suffered two back fractures and was held overnight at the hospital for observation. Witnesses claim that the truck Newton was driving rolled over multiple times. Newton would make a full recovery in 12 days. Newton graduated from Auburn with a degree in sociology in the spring of 2015. Newton was formerly a self-proclaimed pescetarian. As of March 2019 he has become a vegan. Newton partnered with Southern department store chain Belk on his own clothing line, MADE by Cam Newton. On December 30, 2015, Newton confirmed on Twitter that his girlfriend, Kia Proctor, gave birth to a son on December 24, 2015, in Atlanta. He also tweeted, "I've been quiet about this because I didn't want to create a distraction for my team and appreciate the privacy in this joyous time". In February 2017, Newton and Proctor's daughter was born. Proctor gave birth to the couple's third child, a boy, in July 2018. On January 29, 2019, Newton announced plans for his first business venture, Fellaship. A cigar bar-restaurant located near Mercedes-Benz Stadium in downtown Atlanta. ^ "Fodder: Best Cam Newton headlines". al.com. Cam Newton's middle name. It's Jerrell, by the way. ^ Auburn Tigers: player bio for Cameron Newton, "PERSONAL – Born May 11, 1989 ... Son of Cecil and Jackie Newton." ^ Vida, Jason (April 13, 2011). "Cam Newton's potentially historic draft". ESPN.com. Retrieved September 16, 2011. ^ "Ron Rivera praises Cam Newton". ESPN.com. Associated Press. September 12, 2011. Retrieved September 14, 2011. ^ "NFL Rookie Season Passing Yards (as of 2011 NFL Season)". Pro-Football-Reference.com. Retrieved November 14, 2013. ^ "Rushing Touchdowns by an NFL Quarterback in a season". Pro-Football-Reference.com. Retrieved November 14, 2013. ^ Peter King (January 6, 2016). "2015 NFL Awards: MMQB panel picks MVP, top rookies, best coach – The MMQB with Peter King". The MMQB. Retrieved February 8, 2016. ^ "Cam Newton's historic day: 340 yards passing, 100 yards rushing, 5 TDs". CBSSports.com. Archived from the original on March 2, 2016. Retrieved February 8, 2016. ^ Dukes, Deidra. "Carolina Panther and Westlake High Alum Cam Newton Super Bowl Bound". WAGA. Retrieved February 27, 2018. ^ a b Cameron Newton. Rivals.com. Retrieved July 24, 2013. ^ "Cam Newton College Stats". College Football at Sports-Reference.com. Retrieved February 27, 2018. ^ Aschoff, Edward. NFL draft 2011: Tracing Cam Newton's journey to the NFL. ESPN. Retrieved May 1, 2011. ^ "Cam Newton 2007 Game Log". College Football at Sports-Reference.com. Retrieved February 27, 2018. ^ "Hawaii at Florida Box Score, August 30, 2008". College Football at Sports-Reference.com. Retrieved February 27, 2018. ^ Timanus, Eddie (October 22, 2010). "Auburn system suits quarterback Cam Newton well". USA Today. ^ Jeremy Fowler (November 21, 2008). "Backup QB Cameron Newton arrested for possession of stolen property, suspended from team". Orlando Sentinel. Archived from the original on January 7, 2009. ^ "Cam Newton, Lame Laptop Thief". thesmokinggun.com. ^ Evans, Thayer (November 9, 2010). "Source: Newton left Florida after cheating scandal". Fox Sports. Archived from the original on February 10, 2011. Retrieved February 7, 2016. ^ Thamel, Pete; Glier, Ray (November 9, 2010). "Newton Faced Suspension at Florida". New York Times. Archived from the original on May 23, 2013. Retrieved February 7, 2016. ^ Clark, Matthew (December 7, 2009). "Newton leads Blinn to title". Morning Sun. ^ a b Schlabach, Mark. NFL draft 2011: Tracing Cam Newton's journey to the NFL. ESPN. Retrieved May 1, 2011. ^ Cameron Newton. Rivals.yahoo.com (December 31, 2009). Retrieved on July 1, 2011. ^ Recruit search. Rivals.yahoo.com. Retrieved on July 1, 2011. ^ 2010 Prospect Ranking. Rivals100.rivals.com. Retrieved on July 1, 2011. ^ Smith, Erick (September 11, 2010). Oklahoma coach Bob Stoops on recruiting Cam Newton: 'Didn't notice anything". USA Today. Retrieved August 20, 2011. ^ "Arkansas State at Auburn Box Score, September 4, 2010". College Football at Sports-Reference.com. Retrieved January 13, 2018. ^ "Cameron Newton Named SEC Offensive Player Of The Week". Auburn Football. September 6, 2010. Retrieved September 1, 2011. ^ Maisel, Ivan (September 26, 2010). "Cam Newton powers Auburn to 4–0 start". ESPN. ^ "Louisiana-Monroe at Auburn Box Score, October 2, 2010". College Football at Sports-Reference.com. Retrieved January 13, 2018. ^ "Auburn at Kentucky Box Score, October 9, 2010". College Football at Sports-Reference.com. Retrieved January 13, 2018. ^ "Scoring Summary (Final) Auburn Football No. 12 Arkansas vs No. 7 Auburn (Oct 16, 2010 at Auburn, AL)" (PDF). CSTV.com. Retrieved October 28, 2010. ^ Heismanpundit (October 12, 2010). "The Heisman Pundit Heisman Poll, Week 6". HeismanPundit.com. Retrieved July 1, 2011. ^ Smith, Erick (November 17, 2010). "Heisman Watch: Auburn's Cam Newton continues to lead". USAToday.com. Retrieved September 18, 2015. ^ "LSU at Auburn Box Score, October 23, 2010". College Football at Sports-Reference.com. Retrieved February 27, 2018. ^ Forde, Pat. "Cam Newton steps up against LSU". ESPN. Retrieved October 23, 2010. ^ Evans, Thayer. "Cam Newton is super against LSU". Fox News Channel. Retrieved October 25, 2010. ^ Scarbinsky, Kevin. "Cam Newton has a Heisman Moment". Birmingham News. Alabama Media Group. Retrieved October 23, 2010. ^ Lindsay, John. "Heisman: Auburn's Cam Newton stays atop SHNS Heisman Poll". E. W. Scripps Company. Archived from the original on April 7, 2012. Retrieved October 28, 2010. ^ Goldberg, Charles. "Halftime stats: Auburn's Cam Newton becomes first SEC player to throw for 2,000 yards, run for 1,000 in a season". Birmingham News. Alabama Media Group. Retrieved November 13, 2010. ^ "Georgia at Auburn Box Score, November 13, 2010". College Football at Sports-Reference.com. Retrieved February 27, 2018. ^ "Auburn at Alabama Box Score, November 26, 2010". College Football at Sports-Reference.com. Retrieved January 13, 2018. ^ "South Carolina vs Auburn Box Score, December 4, 2010". College Football at Sports-Reference.com. Retrieved February 27, 2018. ^ Schlabach, Mark. "Cam Newton puts stamp on title game". ESPN. Retrieved December 7, 2010. ^ "Four finalists named for Heisman Trophy". ESPN. Associated Press. Retrieved December 7, 2010. ^ Smith, Erick (December 11, 2010). "Auburn quarterback Cam Newton captures Heisman Trophy". USA Today. Retrieved December 11, 2010. ^ "Heisman Memorial Trophy Winners". College Football at Sports-Reference.com. Retrieved February 27, 2018. ^ Russo, Ralph. "Auburn, Oregon give BCS title game new look". AL.com. Alabama Media Group. Associated Press. Retrieved December 5, 2010. ^ "Spurrier's Prediction". Football Scoop. Archived from the original on December 8, 2010. ^ Finney, Peter (January 12, 2011). "We'll remember Auburn's defense prevailing – and those Oregon socks". NOLA.com, The Times-Picayune. Retrieved September 18, 2015. ^ Martin, Kimberly A. (December 11, 2010). "Auburn's Newton wins Heisman in landslide". Retrieved September 18, 2015. ^ "Cam Newton Wins Auburn's Third Heisman Trophy". ^ Goldberg, Charles (December 1, 2010). "Auburn's Cam Newton timeline: From recruitment to NCAA ruling". al.com. Alabama Media Group. ^ "Rogers: Cecil Newton put price on son". ESPN. October 12, 2011. ^ a b c d "Cam Newton Investigation Documents" (PDF). usatoday.net. November 4, 2011. ^ "Breaking news: Cam Newton ruled eligible by NCAA". mercurynews.com.com. December 1, 2010. ^ Scarbinsky, Kevin (December 7, 2010). "Scarbinsky: Cecil Newton should be barred from Heisman ceremony". AL.com. Alabama Media Group. ^ "Cam Newton – 2010 Heisman Winner". Heisman.com. Archived from the original on October 7, 2011. ^ "NCAA Letter To Jay Jacobs" (PDF). al.com. Alabama Media Group. October 12, 2011. ^ a b "NCAA says Auburn had no major violations, ends investigation in signing of quarterback Cam Newton". al.com. Alabama Media Group. October 12, 2011. ^ "NCAA's investigation into Auburn, Cam Newton included review of bank records, IRS documents, phone records, emails". AL.com. Alabama Media Group. October 12, 2011. ^ a b "NCAA: No major violations for Auburn". ESPN. October 12, 2011. ^ "NCAA finds no major violations at Auburn in Cam Newton case". USATODAY.com. October 12, 2011. ^ "Cam Newton Works Out For Media". ESPN. February 10, 2011. ^ Associated Press (April 29, 2011). Panthers make Cam Newton top pick. ESPN.com. Retrieved September 16, 2011. ^ "Auburn No. 1 Overall Picks". Pro-Football-Reference.com. Retrieved February 27, 2018. ^ Cam Newton working daily with Chris Weinke | ProFootballTalk. Profootballtalk.nbcsports.com. Retrieved on July 1, 2011. ^ "Carolina Panthers' Jerry Richardson to Cam Newton – No tats, piercings – ESPN". ESPN. August 25, 2011. Retrieved September 4, 2012. ^ Dave Zirin (August 27, 2011). "Jerry Richardson, Cam Newton and the Color of Control". The Nation. Retrieved September 4, 2012. ^ "Cam Newton – QB – Auburn – 2011 NFL Draft Scout Player Profile". Retrieved May 11, 2013. ^ "Cam Newton – QB – Auburn – 2011 NFL Combine Results". NFL Combine Results. Retrieved May 11, 2013. ^ Schefter, Adam (July 29, 2011). "Cam Newton agrees to contract". ESPN. Retrieved July 29, 2011. ^ Person, Joseph (July 26, 2011). "Cam Newton wearing jersey No. 1 – for now". The Charlotte Observer. Retrieved July 3, 2013. ^ "Cam Newton will wear No. 1 in Carolina". al.com. Retrieved September 4, 2012. ^ Carolina Panthers vs. Arizona Cardinals – Box Score. ESPN.go.com (September 11, 2011). Retrieved on October 23, 2011. ^ Newton sets more records, Packers get win. ESPN.com. Retrieved September 18, 2011. ^ a b "Newton throws for NFL rookie record 432 yards". USAToday.com. Associated Press. September 19, 2011. Retrieved September 18, 2015. ^ Snyder, Deron (September 20, 2011). "Cam Newton Shows Them All". TheRoot.com. Archived from the original on September 21, 2011. Retrieved September 20, 2011. ^ a b "Aaron Rodgers helps Packers overcome Cam Newton's 2nd straight 400-yard day". ESPN.go.com. September 18, 2011. Retrieved September 18, 2011. ^ "2011 Passing Through Week 3". Pro-Football-Reference.com. Retrieved February 27, 2018. ^ "Jacksonville Jaguars at Carolina Panthers – September 25th, 2011". Pro-Football-Reference.com. Retrieved January 13, 2018. ^ "Carolina Panthers at Atlanta Falcons – October 16th, 2011". Pro-Football-Reference.com. Retrieved February 27, 2018. ^ "Washington Redskins at Carolina Panthers – October 23rd, 2011". Pro-Football-Reference.com. Retrieved January 13, 2018. ^ "NFL Recap – Carolina Panthers at Tampa Bay Buccaneers – Dec 04, 2011". CBSSports.com. December 4, 2011. Retrieved September 4, 2012. ^ "Tampa Bay Buccaneers at Carolina Panthers – December 24th, 2011". Pro-Football-Reference.com. Retrieved February 27, 2018. ^ "Carolina Panthers at New Orleans Saints – January 1st, 2012". Pro-Football-Reference.com. Retrieved January 13, 2018. ^ "Cam Newton 2011 Game Log". Pro-Football-Reference.com. Retrieved January 13, 2018. ^ "NFC Nationals vs. AFC Americans – Box Score – January 29, 2012". www.foxsports.com. Retrieved February 27, 2018. ^ a b "Players rank Cam Newton 46th on NFL's Top 100 Players of 2013". AL.com. Retrieved December 9, 2014. ^ "Game day is like Christmas for kids who get TD footballs from Cam Newton". ESPN.com. Retrieved March 29, 2016. ^ "2012 Carolina Panthers Statistics & Players". Pro-Football-Reference.com. Retrieved January 13, 2018. ^ "Atlanta Falcons at Carolina Panthers – December 9th, 2012". Pro-Football-Reference.com. Retrieved February 27, 2018. ^ "Cam Newton 2012 Game Log". Pro-Football-Reference.com. Retrieved January 13, 2018. ^ "Cam Newton". Pro-Football-Reference.com. Retrieved December 9, 2014. ^ "2012 NFL Passing". Pro-Football-Reference.com. Retrieved February 27, 2018. ^ "2013 NFL Standings & Team Stats". Pro-Football-Reference.com. Retrieved February 27, 2018. ^ "Cam Newton 2013 Game Log". Pro-Football-Reference.com. Retrieved January 13, 2018. ^ "2013 Carolina Panthers Statistics & Players". Pro-Football-Reference.com. Retrieved January 13, 2018. ^ "Divisional Round – San Francisco 49ers at Carolina Panthers – January 12th, 2014". Pro-Football-Reference.com. Retrieved January 13, 2018. ^ "2014 NFL Player Passing Stats – National Football League – ESPN". ESPN.com. Retrieved December 9, 2014. ^ "Inside the Panthers". charlotte.com. Retrieved December 9, 2014. ^ "Rivera: Cam Newton's ankle injury likely from Auburn". NFL.com. Retrieved December 9, 2014. ^ Siebert, Dave. "Breaking Down Cam Newton's Ankle Injury and Surgery". Bleacher Report. Retrieved December 9, 2014. ^ "Jamie Collins Broke Cam Newton's Rib In Patriots-Panthers Preseason Game (GIF) – New England Patriots". NESN.com. Retrieved December 9, 2014. ^ "Is Cam Newton NFL's most underrated QB?". Yahoo Sports. September 15, 2014. Retrieved December 9, 2014. ^ Stevens, AJ (October 3, 2014). "PFF Preview: Bears @ Panthers, Week 5". Pro Football Focus. Retrieved September 17, 2015. ^ McGuinness, Gordon (October 3, 2014). "All-Star Team of the Week: Week 5". Pro Football Focus. Retrieved September 17, 2015. ^ "Greg Cosell's Week 5 analysis: Cam Newton's improvement is clear". Yahoo Sports. October 7, 2014. Retrieved December 9, 2014. ^ Fahey, Cian (January 1, 2015). "Film Room: Cam Newton". FootballOutsiders.com. Retrieved September 17, 2015. ^ Fahey, Cian (May 26, 2015). "Cam Newton's Development Has Made Him Worth Massive Contract". BleacherReport.com. Retrieved September 17, 2015. ^ "Carolina Panthers at Cincinnati Bengals – October 12th, 2014". Pro-Football-Reference.com. Retrieved February 27, 2018. ^ Jones, Jonathan (October 12, 2014). "Carolina Panthers quarterback Cam Newton finally looks the part". Charlotte Observer. Retrieved September 17, 2015. ^ Phillips, Chris (October 17, 2014). "PFF Preview: Panthers @ Packers, Week 7". Retrieved September 17, 2015. ^ "Carolina Panthers at New Orleans Saints – December 7th, 2014". Pro-Football-Reference.com. Retrieved February 27, 2018. ^ "2014 NFL Week 14 Leaders & Scores". Pro-Football-Reference.com. Retrieved February 27, 2018. ^ "Cam Newton Named NFC Offensive Player of Week". ProPlayerInsiders.com. December 10, 2014. Retrieved September 17, 2015. ^ "2014 NFL Standings & Team Stats". Pro-Football-Reference.com. Retrieved January 13, 2018. ^ "Panthers 34, Falcons 3". Reuters.com. December 28, 2014. Retrieved September 17, 2015. ^ Mello, Igor (December 28, 2014). "Panthers' Cam Newton finds paydirt twice to take NFC South crown". CBSSports.com. Retrieved September 17, 2015. ^ Voth, Bill (May 11, 2015). "On Cam Newton's Birthday, a Look at His First Four Seasons". blackandbluereview.com. Retrieved September 18, 2015. ^ "Cam Newton Game-by-Game Stats". ESPN. ^ "Divisional Round – Carolina Panthers at Seattle Seahawks – January 10th, 2015". Pro-Football-Reference.com. Retrieved January 13, 2018. ^ Voth, Bill (May 20, 2015). "Cam Newton Drops to No. 73 on 'Top 100 Players' List". blackandbluereview.com. Retrieved September 18, 2015. ^ Wesseling, Chris (June 2, 2015). "Cam Newton, Panthers reach $103.8M extension". NFL.com. Retrieved June 2, 2015. ^ "Sam Monson". Twitter. Retrieved February 8, 2016. ^ "Carolina Panthers grab an ugly win against Jacksonville in season opener". charlotteobserver. Retrieved February 8, 2016. ^ "Houston Texans at Carolina Panthers – September 20th, 2015". Pro-Football-Reference.com. Retrieved January 13, 2018. ^ "New Orleans Saints at Carolina Panthers – September 27th, 2015". Pro-Football-Reference.com. Retrieved January 13, 2018. ^ "Passing TD and rushing TD". pro-football-reference.com. Retrieved September 29, 2015. ^ a b c d e "Cam Newton pushing Panthers with MVP-caliber performance". NFL.com. Retrieved February 8, 2016. ^ "After Further Review: How Cam Newton is growing into a complete QB". CBSSports.com. Archived from the original on October 4, 2015. Retrieved February 8, 2016. ^ "FOOTBALL OUTSIDERS: Innovative Statistics, Intelligent Analysis – Film Room: Cam Newton". Retrieved February 8, 2016. ^ "Carolina at Tampa Bay – 2015-10-04 – National Football League – Yahoo! Sports". Yahoo Sports. Retrieved February 8, 2016. ^ "2015 NFL Player Rushing Stats – National Football League – ESPN". ESPN.com. Retrieved February 8, 2016. ^ "Seahawks in last place after blowing another big fourth-quarter lead". Yahoo Sports. October 19, 2015. Retrieved February 8, 2016. ^ "Rapid Reactions: Panthers Finally Beat Seahawks". Black and Blue Review. Retrieved February 8, 2016. ^ "ESPN Stats & Info on Twitter". Twitter. Retrieved February 8, 2016. ^ "Chris Trapasso". Twitter. Retrieved February 8, 2016. ^ "Panthers remain undefeated, slog past Eagles in a lumpy game". Yahoo Sports. October 26, 2015. Retrieved February 8, 2016. ^ "Indianapolis Colts at Carolina Panthers – November 2nd, 2015". Pro-Football-Reference.com. Retrieved February 27, 2018. ^ a b "FOOTBALL OUTSIDERS: Innovative Statistics, Intelligent Analysis – Clutch Encounters: Week 8". Retrieved February 8, 2016. ^ "Green Bay at Carolina – 2015-11-08 – National Football League – Yahoo! Sports". Yahoo Sports. Retrieved February 8, 2016. ^ Bryan Knowles. "Packers vs. Panthers: Carolina Grades, Notes and Quotes". Bleacher Report. Retrieved February 8, 2016. ^ "Cam Newton wins NFC Offensive Player of the Week award". charlotteobserver. Retrieved February 8, 2016. ^ "Panthers at Titans: Stats and Superlatives". Black and Blue Review. Retrieved February 8, 2016. ^ a b "Randall Liu". Twitter. Retrieved February 8, 2016. ^ a b "Cam Newton named NFC Offensive Player of the Week". Archived from the original on January 30, 2016. Retrieved February 8, 2016. ^ "Dominant Panthers prove they're worthy of 16–0 talk". NFL.com. Retrieved February 8, 2016. 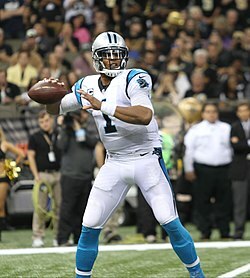 ^ "CAR-NO Grades: Panthers fend off Saints, remain undefeated". Retrieved February 8, 2016. ^ a b "Newton wins another NFC Offensive Player of the Week award – ProFootballTalk". Retrieved February 8, 2016. ^ Reed, Steve (December 13, 2015). "Cam Newton, Panthers pound Falcons 38–0, clinch 1st-round bye". The Denver Post. Retrieved February 8, 2016. ^ "Carolina Panthers at New York Giants – December 20th, 2015". Pro-Football-Reference.com. Retrieved February 27, 2018. ^ Knowles, Bryan (December 20, 2015). "Panthers vs. Giants: Carolina Grades, Notes and Quotes". Bleacher Report. Retrieved February 8, 2016. ^ "Stats and Superlatives: Newton's 4th Player of the Week Award". Black and Blue Review. Retrieved February 8, 2016. ^ "MVP Watch: Cam Newton pulling away from pack". ESPN.com. Retrieved February 8, 2016. ^ "Carolina Panthers at Atlanta Falcons – December 27th, 2015". Pro-Football-Reference.com. Retrieved February 27, 2018. ^ "Tampa Bay Buccaneers at Carolina Panthers – January 3rd, 2016". Pro-Football-Reference.com. Retrieved January 13, 2018. ^ "Cam Newton highlights Week 17 Players of Week". NFL.com. Retrieved February 8, 2016. ^ Jaxon (January 6, 2016). "Newton Wins 5th Player of the Week Award of 2015 Season". Cat Scratch Reader. Retrieved February 8, 2016. ^ "Cam Newton Advanced Stats and Metrics Profile: Rushing Production". PlayerProfiler.com. ^ "Pro Football Writers". Twitter. Retrieved February 8, 2016. ^ "Arizona at Carolina – 2016-01-24 – National Football League – Yahoo! Sports". Yahoo Sports. Retrieved February 8, 2016. ^ "Carolina Panthers". Carolina Panthers. Retrieved February 27, 2018. ^ Reyes, Lorenzo (February 6, 2016). "Cam Newton named NFL MVP". USA Today. Retrieved February 6, 2016. ^ "Super Bowl 50 – Denver Broncos vs. Carolina Panthers – February 7th, 2016". Pro-Football-Reference.com. Retrieved August 7, 2017. ^ "Super Bowl 50 – National Football League Game Summary" (PDF). NFL.com. Retrieved August 7, 2017. ^ "'Top 100 Players of 2016': No. 2 Tom Brady". NFL.com. ^ "Cam Newton is NFL's No. 7 player in merchandise sales". April 25, 2016. ^ "Newton sets record for most rushing TDs by a QB". si.com. September 9, 2016. Retrieved September 15, 2016. ^ Ingrassia, Nunzio (September 9, 2016). "Cam Newton breaks a touchdown record held by Steve Young in first half". Fox Sports. Retrieved September 9, 2016. ^ "Panthers' Cam Newton: Passes, runs for scores in Opening Night loss". cbssports.com. Retrieved September 9, 2016. ^ "Carolina Panthers at Seattle Seahawks – December 4th, 2016". Pro-Football-Reference.com. Retrieved January 13, 2018. ^ "Cam Newton 2016 Game Log". Pro-Football-Reference.com. Retrieved January 13, 2018. ^ "2016 Carolina Panthers Statistics & Players". Pro-Football-Reference.com. Retrieved January 13, 2018. ^ "'Top 100 Players of 2017': No. 44 Cam Newton – NFL Videos". nfl.com. Retrieved November 23, 2017. ^ "Panthers' Cam Newton to have shoulder surgery, to miss OTAs". ESPN.com. ^ Sessler, Marc. "Cam Newton recovering after shoulder surgery". NFL. Retrieved March 30, 2017. ^ a b Ripple, Zachary (October 4, 2017). "Cam Newton makes sexist remark and smirks at female reporter's question". New York Daily News. Retrieved October 5, 2017. ^ Armour, Nancy (October 5, 2017). "Contrary to what Carolina Panthers quarterback Cam Newton says, sexism isn't funny". USA Today. Retrieved October 5, 2017. ^ Rand, Michael (October 5, 2017). "On Cam Newton, a 'funny' question and a sexist response". Star Tribune. Retrieved October 5, 2017. ^ Vultaggio, Maria (October 5, 2017). "'Racist' Cam Newton Reporter Jourdan Rodrigue Tweeted N-Word, Issues Apology". International Business Times. Retrieved October 5, 2017. ^ Perez, A.J. (October 5, 2017). "Dannon cuts ties with Panthers quarterback Cam Newton". USA Today. Retrieved October 5, 2017. ^ Hoffman, Benjamin (October 5, 2017). "Cam Newton Loses Dannon Sponsorship Deal After Sexist Remarks". The New York Times. Retrieved October 5, 2017. ^ Hoffman, Benjamin (October 5, 2017). "Cam Newton Apologizes for Sexist Remarks". The New York Times. Retrieved October 6, 2017. ^ Harmon, Matt. "Cam Newton runs Panthers' evolved offense perfectly". NFL. Retrieved November 14, 2017. ^ Bergman, Jeremy. "Cam Newton leads Panthers' reborn run game to win". NFL. Retrieved November 14, 2017. ^ Maya, Adam (November 15, 2017). "Tom Brady, Cam Newton among Players of the Week". NFL.com. ^ "Cam Newton 2017 Game Log". Pro-Football-Reference.com. Retrieved January 13, 2018. ^ "2017 NFL Standings & Team Stats". Pro-Football-Reference.com. Retrieved February 27, 2018. ^ "Wild Card – Carolina Panthers at New Orleans Saints – January 7th, 2018". Pro-Football-Reference.com. Retrieved February 27, 2018. ^ "Scott Says: Hurricane remnants in Charlotte make Panthers' loss to Falcons feel weird". Charlotte Observer. Retrieved October 6, 2018. ^ "Newton's 4 TDs lift Panthers over Bengals 31–21". USA TODAY. Retrieved October 6, 2018. ^ "2018 Carolina Panthers Statistics & Players". Pro-Football-Reference.com. Retrieved January 22, 2019. ^ Wagner-McGough, Sean (December 18, 2018). "Cam Newton opens up on shoulder injury after latest loss, acknowledges Panthers could shut him down". CBS Sports. ^ "With Cam hurt, Panthers keeping 'options open'". ESPN.com. January 16, 2019. Retrieved January 22, 2019. ^ "Cam Newton undergoes shoulder surgery". NFL. Retrieved January 24, 2019. ^ "Cam Newton polls as NFL's most underrated QB by defensive players". Panthers Wire. January 10, 2019. Retrieved January 22, 2019. ^ Matt Fitzgerald. "All-Iron Award 2015: Full List of Winners of Thanksgiving Day Award". Bleacher Report. Retrieved February 8, 2016. ^ a b Brinson, Will (September 18, 2011). (Record beat by Andrew Luck) Cam Newton breaks more rookie passing records Archived June 3, 2013, at the Wayback Machine. CBS Sports.com. Retrieved September 18, 2011. ^ Wire, SI. "Newton sets record for most rushing TDs by a QB". ^ Beard, Aaron (September 18, 2011). "Rodgers, Packers Beat Newton, Panthers 30–23". ABCNews.com. Retrieved September 18, 2011. ^ "Cam Newton sets NFL record for most rushing touchdowns by a quarterback". SI.com. ^ "Cam Newton adds another record in tying Tom Brady's awards mark". ^ "Carolina Panthers: Cam Newton". ^ "Gil Brandt on Twitter". Twitter. Retrieved February 8, 2016. ^ "Most rushing touchdowns by QB, season". pro-football-reference.com. Retrieved November 28, 2015. ^ "Stats and Superlatives: Panthers' Historical Regular Season". Black and Blue Review. Retrieved February 8, 2016. ^ a b "NFL morning after: Rex Ryan's revenge headlines a wild Week 17 – ProFootballTalk". Retrieved February 8, 2016. ^ a b "Rookie Cam Newton becomes first NFL quarterback to throw for more than 400 yards in first two games". ^ "Cam Newton's Wonderlic Test Score". wonderlictestsample.com. ^ Berry, Matthew (October 14, 2011). "Fantasy football advice for Week 6: Sleepers and busts, player rankings, good and bad matchups". go.com. ESPN. Retrieved October 23, 2011. ^ "Player Streak Finder | Pro-Football-Reference.com". pfref.com. Retrieved November 23, 2017. ^ "Player Streak Finder - Pro-Football-Reference.com". Pro-Football-Reference.com. ^ "Player Season Finder Query Results - Pro-Football-Reference.com". Pro-Football-Reference.com. ^ "10,000 passing yards & 1,000 rushing yards in first 3 seasons". pro-football-reference.com. Retrieved December 10, 2015. ^ "10,000 passing yards & 2,000 rushing yards in first 4 seasons". pro-football-reference.com. Retrieved December 10, 2015. ^ a b c d "Stats and Superlatives: Panthers at Giants". Black and Blue Review. Retrieved February 8, 2016. ^ "300 passing yards, 100 rushing yards & 5 TD's". pro-football-reference.com. Retrieved December 21, 2015. ^ "Instagram". Instagram. Retrieved February 8, 2016. ^ "200+ passing yards, 80+rushing yards, 2+ passing TD and 1+ rushing TD". pro-football-reference.com. Retrieved September 29, 2015. ^ "Rapid Reactions: Panthers Hold Off Packers, Remain Unbeaten". Black and Blue Review. Retrieved February 8, 2016. ^ "Updating Cam Newton's Rise in NFL Record Books". Black and Blue Review. Retrieved February 8, 2016. ^ "Cam Newton sets Auburn NFL record". AL.com. Retrieved February 8, 2016. ^ "Comparing Quarterbacks: Cam Newton vs. Peyton Manning". ^ "Michael David Smith". Twitter. Retrieved February 8, 2016. ^ "Carolina Panthers". charlotteobserver. Retrieved February 8, 2016. ^ "NFL Winners and Losers: What now, Denver Broncos?". Yahoo Sports. December 21, 2015. Retrieved February 8, 2016. ^ "Stats and Superlatives from the NFC Championship". January 25, 2016. ^ "On Cam Newton's Birthday, a Look at His First Four Seasons". May 11, 2015. ^ "Carolina Panthers Team Encyclopedia". Pro-Football-Reference.com. Retrieved February 11, 2017. ^ "Panthers vs. Washington instant analysis: Cam Newton belongs in MVP race". charlotteobserver. Retrieved February 8, 2016. ^ "A History-Filled Stats and Superlatives". Black and Blue Review. Retrieved February 8, 2016. ^ "Newton not concerned with MVP chatter". Archived from the original on February 1, 2016. Retrieved February 8, 2016. ^ "Chris Wesseling on Twitter". Twitter. Retrieved February 8, 2016. ^ "NFL Recap – Washington Redskins at Carolina Panthers – Nov 22, 2015 – CBSSports.com Game Recap". CBSSports.com. November 22, 2015. Archived from the original on November 25, 2015. Retrieved February 8, 2016. ^ "Cam Newton's brother is already a football wunderkind". Sporting News. Retrieved October 29, 2015. ^ Thompson, Carmen R. (June 26, 2013). "My path to the pros". ESPN the Magazine. ESPN. Retrieved November 3, 2015. ^ Whyte, Daniel III. "Cam Newton: 'It's Just a God Thing'". BCNN1WP.wordpress.com. Retrieved September 18, 2015. ^ "Cam Newton". The Cam Newton Foundation. Retrieved October 24, 2014. ^ "Cam Newton injured in uptown Charlotte car wreck". myfox8.com. Retrieved December 9, 2014. ^ "Newton scales back for Thanksgiving meal – Carolina Panthers Blog – ESPN". Retrieved September 20, 2015. ^ Nic Screws (April 9, 2013). "The ESQ&A: Cam Newton on His New Clothing Line". Esquire. Retrieved February 8, 2016. ^ Jones, Jonathan (December 30, 2015). "Panthers QB Cam Newton announces birth of son". Charlotte Observer. The Charlotte Observer. ^ Jones, Jonathan (December 31, 2015). "Panthers QB Cam Newton has 'glow' after welcoming a son named Chosen". Charlotte Observer. The Charlotte Observer. Retrieved January 1, 2016. ^ Voth, Bill. "Cam Newton's Baby Daughter Has Arrived". Black And Blue Review. Retrieved March 14, 2017. ^ Eric Mandel (January 20, 2019). "Cam Newton set to open cigar bar-lounge near Mercedes-Benz Stadium". Atlanta Business Chronicle. Retrieved January 20, 2019. Layden, Tim. "The Real Thing". Sports Illustrated Kids 23.10 (2011): 50. 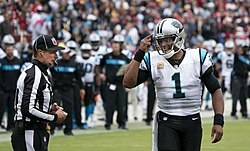 Article on Cam Newton's first 3 games in the NFL. Wikimedia Commons has media related to Cam Newton.